Samsung’s next flagship smartphones, the Galaxy S9 and S9+, go on sale next week. As is customary, Samsung seeded a handful of units to reviewers across the web to gauge their feedback and help build hype around the pending launch. With new smartphones seemingly dropping every other month and the lines differentiating them becoming more blurred, finding the perfect handset can be tough. Does the S9 deliver or are you better off looking elsewhere? Hopefully you’ll find those answers and more now that review embargos have lifted. Let’s see what the experts have to say! There comes a point in most successful products’ existences where they become predictable. The new model, building off of the triumphs of its prior version, maintains the same look and feel while introducing more subtle enhancements. Apple’s used this tack with the iPhone and iPad for multiple generations, and Microsoft has done the same with the Surface Pro in recent years. Don’t rock the boat; don’t fix what isn’t broken. And so, if you’ve seen last year’s Galaxy S8 from Samsung, you’ve seen this year’s Galaxy S9. The fact of the matter is that the S9 finds the electronics giant mostly refining things on its flagship. Nowhere is this more apparent than in the phone’s design language. I have the S8+ and S9+ sitting side by side on my desk as I write this, and I’d defy you to tell me which is which without turning over the phones. If you squint, you can see that the bezels are a fraction of a millimeter smaller on the new phone. On the inside, as the first phone sporting Qualcomm’s new Snapdragon 845 processor, the S9 is setting a new standard for what great performance Android should be. Everything just feels snappier, from launching apps to flipping through different pages on the home screen, to the point where I was wondering if Samsung did some sneaky stuff like speed up the S9's UI animations. But after seeing the benchmark numbers posted by the S9+, it’s clear there wasn’t really a need. Across both compute and graphics tests, the S9 performed 25 percent better than last year’s top marks. On Geekbench 4, the S9+ hit 8,414, versus the Huawei Mate 10 Pro’s score of 6,766 or the OnePlus 5T’s score of 6,752. Meanwhile, on 3DMark’s Slingshot Unlimited graphics test, the S9 scored 6,497, compared to 5,143 for the OP5T. And if you’re like me who often finds themselves living and working off your phone, the speed at which the S9 switches between even the most cumbersome of apps is downright delightful. In regular lighting situations, the Dual Aperture feature stops down to f/2.4, but when environmental lighting drops below 100 lux, the aperture widens to f/1.5, letting in more light, ostensibly yielding better images when shooting at night or in moody taverns. That f/1.5 is the widest aperture the world has seen on any smartphone camera, so that alone should provide benefits—theoretically. But what about shooting at f/2.4? Does it provide any payoffs in well-lit environments? The basic tenets of photography tells us we might see a sharper photo at f/2.4. But the fact is, after shooting scores of test shots at both f/2.4 and f/1.5, I couldn’t find relevant payoffs from Samsung’s dual aperture approach. Make no mistake: The S9 family’s rear camera produces amazing photos, and it’s a big advancement over what Samsung delivers in the Galaxy S8. But I would have been just as happy with a fixed f/1.5 aperture (notwithstanding the amazing mechanical engineering that switches the S9’s aperture in such a small physical space). There’s plenty of customization options to make your phone feel unique. For example, you can choose from a variety of clock designs for the always-on display, and you can even pick any color from a color wheel for further personalization. Most people won’t dive into these options, but we’re happy to see it available. Another way to see the sheer amount of options is with the biometric unlocking technologies available on the phone. You can use the iris scanner, fingerprint reader, or facial recognition to unlock the S9, or use them all at the same time. Our favorite is Intelligent Scan, which primarily uses the iris scanner as the main way to unlock the phone, but it falls back to facial recognition if iris doesn’t work. The experience feels a lot like unlocking the iPhone X with FaceID. It’s not as fast as the fingerprint sensor and it doesn’t work all the time, but it’s reliable enough to feel convenient. In our testing, the Google Pixel 2 still offers the most fluid Android experience on a smartphone, likely because Google can optimize the hardware and software. Still, Samsung has come a long way, and we’re loving how the software looks. Our biggest complaint is with updates. The Galaxy S8 and S8 Plus are in the beta process for Android 8.0 Oreo, more than 7 months since Google released the new Android version. The first developer preview of Android P is now available and should officially launch in August, but it’s sad that we likely won’t see it on the S9 and S9 Plus until early next year. If you want the fastest security or version updates, buy a Pixel 2 or an iPhone. After a week of using the S9 Plus as my primary device while traveling across the country and back, I am able to go a full day with a single charge of the 3,500 mAh battery. It appears that battery life is about the same as the Galaxy Note 8. The fact that the Galaxy S8 Plus has wireless charging support means that my device is topped off most of the time since it is convenient to just set the S9 Plus down on a wireless charging pad while at my desk. While it is not an essential feature, wireless charging works well for me to keep my devices fully charged without touching a cable. The Bixby button is still present, but this time Samsung gives you the ability to disable it for launching Bixby Home with a single press. You can still swipe over to a Bixby home screen panel or even choose to hide this and never even see Bixby Home if you desire. A press and hold of the Bixby button will still launch the Bixby voice control utility though. I know Bixby isn't popular with most folks, but it is a very powerful assistant if you give it the time needed to fully understand its capabilities. Samsung’s augmented reality response of sorts to the Animoji feature on the iPhone X has one major benefit compared to Apple’s animated emojis: you can share an AR Emoji as an animated sticker or GIF through a third party messaging app such as WhatsApp. On iPhones, you can only send Animojis through the Messages app on the iPhone X. Or turn your AR Emoji into wallpaper on the Samsung phone or set as an "always on display" image. Otherwise, the advantage goes to Apple, which in letting you create an Animoji in the form of a cartoon pig, unicorn or pile of poo, strikes me as more fun, and frankly a bit less creepy. Samsung on the other hand wants you to create a 3D avatar that looks just like you, all based on a selfie. I just didn’t think my character particularly resembles my visage--though I'll leave others to judge-even though it came fairly close on my beard and mustache. You can customize the avatar by adding (or removing) hair, glasses, clothes, and altering the skin tone. What’s more, though you can mirror your facial movements in creating AR Emojis in a loosely similar fashion to how you can do so with Apple’s Animojis, the tracking wasn’t quite as smooth. All things considered, I can’t help but feel Samsung is holding back this year. To put it in Apple terms, the S9 feels like an S8s. To be clear, that’s fine. Not every phone can – or should – be a game-changer. Besides, Samsung has to save the real good stuff for the S10, as human nature dictates that things with a ’10’ in them are supposed to be the bees knees. Though I’m disappointed Samsung crippled the smaller model and I’m not convinced the new features justify an upgrade, the S9 is hard to disparage. Stereo speakers, tiny bezels, expandable storage, and a headphone jack are a rare combination these days, especially in a relatively small body. Add to that a noticeably improved camera and a lack of competition this spring – LG is withholding its flagship until the summer – and Samsung is entering 2018 strong. Just don’t rush out to replace your S8 or Pixel 2 day one. 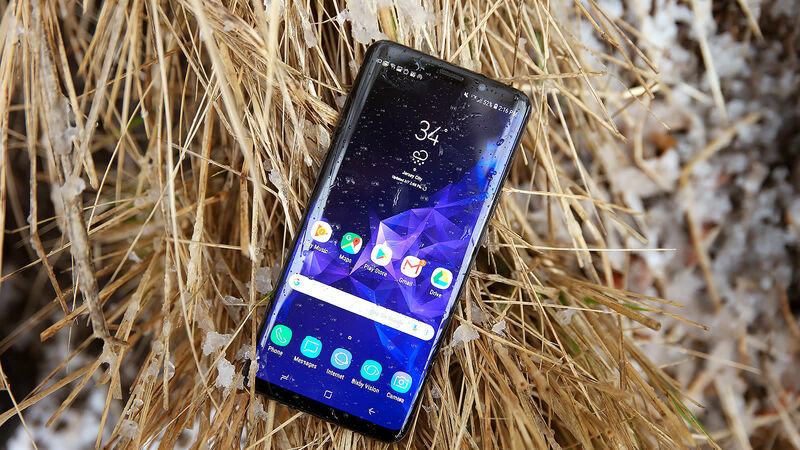 It's become increasingly clear to me that the Galaxy S line of phones is no longer exciting, at least from the standpoint of those who strive to see the latest and greatest technology. They are, instead, becoming the new standard Android phone by which all others are measured as a baseline. A vast majority of Galaxy S9 buyers will not know much about the details of their phones, nor do they need to — but they know that this phone has cool new features, does everything they ask of it, and in turn brings no measurable flaws, trade-offs or downsides. These are expensive phones, but the value proposition is pretty simple. When someone walks in the store and asks for a phone that has a specific feature or can do certain things, undoubtedly the Galaxy S9 or S9+ can do it — and that same phone can fulfill different requests from the next person that walks in. Samsung doesn't have to turn away any customers, because these phones just do everything. It's funny how we now appreciate a phone that just does things customers want, in a normal way, rather than trying to force some new agenda or change before it's ready to happen. With the Galaxy S9 and S9+, Samsung isn't pushing the envelope: it's just making phones that can appeal to as many people as possible. The excellence in these phones is that Samsung managed to make the "phone for the masses" while keeping them grounded as a proper, finished product rather than a portmanteau of random ideas that's less than the sum of its parts.